In this month’s edition of @waterloo (the University of Waterloo alumni e-newsletter), I was excited to see a link to An Interview with Auvik Networks. Auvik’s three co-founders (Marc Morin, Alex Hoff, and David Yach) are all UW alumni, and each had their own notable successes in the Waterloo tech scene prior to joining forces to form Auvik. I was fortunate at Sandvine to work with both Marc and Alex, so I was eager to see what they had to say. While the interview was fairly general, I did find one point particularly interesting. 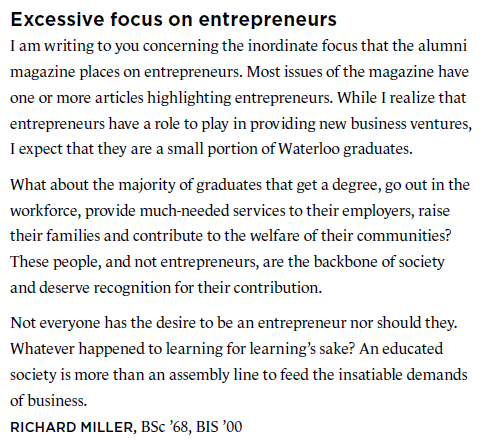 Now, I realize that Marc’s message and Richard’s are slightly different, but they share the common element that there’s no shame in not starting a company right out of school…and in a tech-heavy region like Waterloo, it can be easy to forget that. I’ve spoken with many talented individuals who feel like failures in some respects because they’re in their 30s and haven’t started a company yet. But what’s the rush? I’ve also spoken to many talented, but inexperienced, individuals who’ve started companies or joined start-ups fresh out of school…and they really don’t have a clue about so many aspects of entrepreneurship or running a business. I’ve spoken with many talented individuals who feel like failures in some respects because they’re in their 30s and haven’t started a company yet. But what’s the rush? While some successful start-ups are started by folks right out of school, those are the incredibly rare exceptions. The more likely scenario is less glamourous: a bunch of recent grads getting together and trying something, but not really having any idea how to succeed, lacking understanding of marketing, financial management, and a whole host of other important functions. They often have a product or an idea for a product, but nothing more, and they soon find out that in the real world, that just isn’t enough. I ask again, what’s the rush? Why not work for a couple of years to get to know some markets, to gain vital skills, to build important professional connections, and to have the luxury of investigating some ideas without being “all in”? I found Marc’s comment to be a refreshing and realistic answer, and given his track record I think the aspiring entrepreneurs of tomorrow should pay close attention. future, but until then I’m learning.